The Knights of Columbus, based in New Haven, announced it is committing $1.4 million to repair or help rebuild churches destroyed or badly damaged by the hurricanes that hit Texas, Florida and the U.S. Virgin Islands. The Knights of Columbus also has earmarked a significant amount of money for upcoming church repair efforts in Puerto Rico. The Knights earlier donated $100,000 to the Archdiocese of San Juan and provided generators, food, water and other necessities to aid relief efforts. Some days before the Knights’ announcement three churches in Texas and two synagogues in Florida sued the Federal Emergency Management Agency over being denied disaster-relief funds because current federal law prohibits houses of worship from receiving disaster relief for reconstruction from FEMA. The Houston Chronicle reported Dec. 7 that a U.S. District Court judge denied a request from the three Texas churches that they be allowed to apply for emergency FEMA grants while their lawsuit moves forward. In Texas, the Knights of Columbus aid to Catholic churches ranges from $60,000 for St. James Church in Refugio to $150,000 for Our Lady of Victory Cathedral in Victoria. 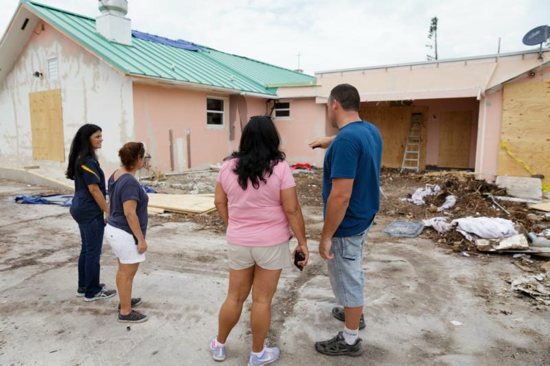 Among the Catholic churches in Florida and the Virgin Islands being assisted by the fraternal organization are St. Peter Church in Big Pine Key, Florida, which will receive $360,000, and Missionary Sisters of the Immaculate Heart of Mary in Frederiksted, Virginia Islands, who will receive $100,000. Knights of Columbus Charities raised $3.8 million for disaster relief in the months following the disasters. More than $720,000 was used to pay for food, water and other critical supplies in the immediate aftermath. On a local level, many Knights helped rescue those stranded by rising waters and reached out to their neighbors in a variety of ways. In 2005, after Hurricane Katrina devastated New Orleans and the southern Louisiana region, the Knights of Columbus contributed $6.7 million to various dioceses to help rebuild the Catholic infrastructure in the area, aiding in the repair of schools, churches and other buildings. In Washington, efforts were underway in the House of Representatives to allow houses of worship to receive federal disaster assistance as part of the Disaster Recovery Reform Act, H.R. 4460, which was approved by the House Committee on Transportation and Infrastructure Nov. 30. The provisions originally were included in the Federal Disaster Assistance Nonprofit Fairness Act introduced in May by Rep. Chris Smith, R-New Jersey, and Rep. Grace Meng, D-New York. At the time, the two sponsors said the bill calls for houses of worship to receive the same consideration as other nonprofit entities in getting aid. “They have been centers of service for communities devastated by natural disasters, like after Superstorm Sandy in 2012 or Hurricane Harvey just this year, providing food, supplies, counseling and other aid despite often suffering damage to their own facilities. They should not be shut out of needed relief and should be treated like other nongovernmental organizations,” Smith said. The chairmen of the U.S. bishops’ Committee for Religious Liberty and Committee on Ecumenical and Interreligious Affairs supported the measure in a letter to Congress in September. A similar bill remained in the Senate Committee on Homeland Security and Governmental Affairs. Legislation authorizing disaster relief for houses of worship such aid was first introduced in 2013, months after Superstorm Sandy devastated New Jersey and parts of New York state and other areas of the Northeast region. The House passed the bill, but it was never taken up in the Senate.